Two-story Borrachos on Yagenbori in the entertainment district serves a wide selection of Mexican and Tex-Mex dishes in an atmospheric vibe from 6pm until late – very late. Part of a small chain, with branches in Tokyo and Okinawa, the place is packed with Mexican decorations (displayed to particularly good effect on the 2nd floor) hauled back from regular trips made by the staff. The huge mural above the entrance makes it a pretty easy place to spot once you are on Yagenbori. Those hoping to find refried beans will still have to head to Mike’s Tex-Mex in Iwakuni, but their dishes are certainly tasty and, by all accounts, quite authentic – we can particularly recommend the soft, corn tacos which come topped with either beef, chicken or shrimp. Tex-Mex dishes include burritos, enchiladas and fajitas and additional main dishes on the menu include Taco Rice, Jambalaya, Brazilian chorizo and Mexican ribeye roll steak. For those with a sweet tooth, desserts include cheese pudding, lime cheese cake and a indulgent-looking banana chimichanga. 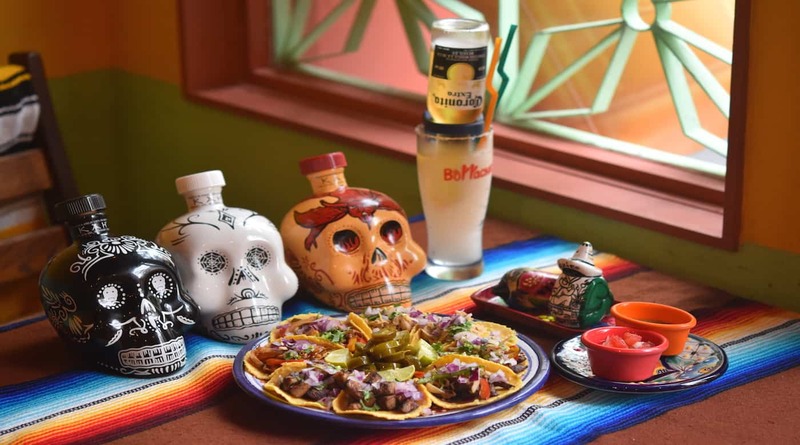 Taking a step back, while Mexican influenced food is becoming slightly more common in Hiroshima, Borrachos offers some hitherto hard to come by appetizers which go very well with their import beers and margaritas. Their salsa and guacamole are made fresh – the guacamole, *really* fresh – and you can also kick off with jalapeño poppers, fried avocado, super spicy chilaquiles, chicken taquitos, and Buffalo chicken wings with a variety of spices. For vegetarian diners, in addition to several appetizers, Borrachos also offers a vegetarian enchilada and burrito. Both are made with soy meat, though I did find the enchilada to have be rather too generously filled with green beans. While it is nice to have a couple of vegetarian options, you get the impression that the chefs don’t sample their non-meat options very much and they consequently don’t come close to their other dishes in terms of taste (topping my enchilada with a side order of jalapeños definitely helped). One thing that should also be mentioned is that they have a massive tequlia selection that starts at ¥600 a glass and goes right on up to ¥2800! Borrachos is quite spacious, with a pretty large upstairs dining area complete with its own bar, making it a great spot for groups. I’ve only eaten here three times, but the food I tried was delicious! It’s great to go with a group and sample a variety of good eats. The pork tacos are delightful, the beef tacos even better (I’m quite sure it was machaca), and the chicken taquitos were out-of-this-world delicious. I plan on coming back for more chicken taquitos and perhaps try out the shrimp enchiladas (and perhaps sample the tequila) very soon.